Recently I put some of my Pinterest pins to work in real life. 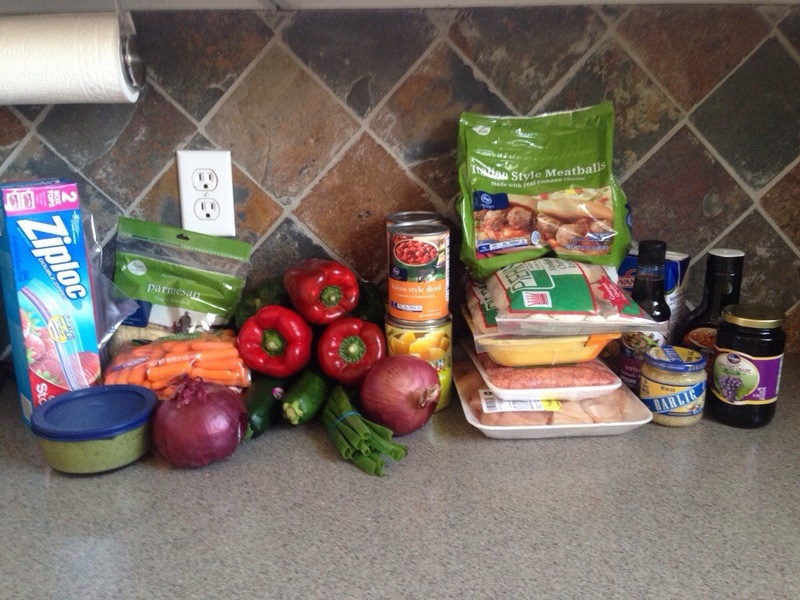 I’ve pinned so many meals: freezer meals, easy 30 minute meals, budget meals and so on. But have I used many of them? Honestly, no. A couple of weeks ago my sisters and I wanted to provide a friend with meals that she could easily feed her family while they were learning how to deal with some major health issues in one of their children. For their privacy, I’ll be vague… but life got shaken up for them. We wanted to do something that could serve the family with little effort on their part so we opted for freezer meals. I browsed my pins and found a handful of things I thought would be doable for my cooking abilities, our budget and their family (and I knew they used their crock-pot a lot). At any rate, this same concept could be used for a family with a new baby, someone who had surgery and such. I tried to choose things that are less popular “delivered meals” since plenty of people make lasagna, chili, casseroles and mashed potatoes. I chose my recipes, made a menu and a “master grocery list” of what each recipe required and efficiently piggy-backed it onto my own grocery shopping trip (separate transaction for the sake of easily splitting the cost). 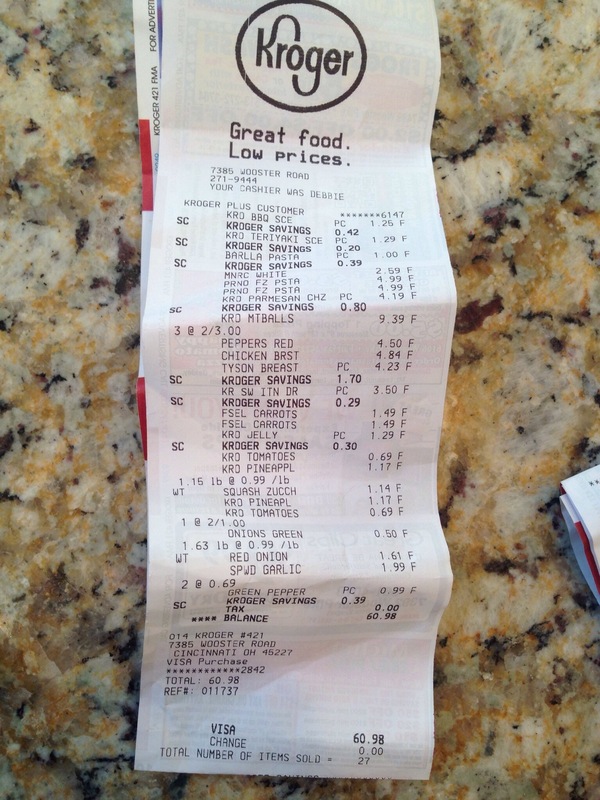 I spent 1 hour at the grocery, $60.98 and 1.5 hours in the kitchen. Each recipe was to be split between 2 bags so these 4 recipes make 8 meals! I lined up my bags, labelled them accordingly and wrote directions (thaw/cook times and serving instructions) on them and put aside. Then boiled 1 lb of chicken breasts while I diced up all of the veggies and set aside. I started piling them into the bags for each meal, squishing and stirring a bit as I went. if something called for 2 can of something then one can went directly into each bag, or I’d split a jar into 2 bags and so on. This way I was using minimal dishes and making minimal clean-up for myself. I approached it assembly line style but I’m sure you could prep one meal at a time too. 36 frozen meatballs, 160z grape jelly, 20 oz BBQ sauce. Label: Add 2 Tbsp olive oil, crockpot low 6 hours, serve over noodles. Label: Thaw, pour into pan, bake 350F for 1 hour. I let out all of the air out of each bag, sealed them securely, laid them flat in my freezer in a stack and delivered them a few days later with the boxes of rice and noodles as well. I figured they could serve salads or veggies as they pleased along with with each meal. Hopefully it will be something they can enjoy as a family without much effort of planning. I’ve heard they already did a couple of the meals and so far they are a success with the kids too! This is great! We are having our first baby and I’m planning to put some frozen meals together beforehand. These are great b/c they aren’t the usual pasta dishes that everyone does! Found this on Pinterest. Was really easy to prep and came in way under budget. Have only tried the Sausage and Peppers and picky husband ate seconds. Looking forward to trying the others. Posted final picture of all my bags on Facebook and linked this site. My friends were most impressed and many may even attempt this. Good job!